Sometimes life is funny like this. When you thought you had seen everything in baseball, the universe will go out of its way to prove you wrong. On April 13, during a routine rundown, the Uni-Lions somehow turned it into a double play with some Little League-esque baserunning blunder. It was bottom of the fifth, one out with bases loaded. The Uni-Lions’ hit machine 陳傑憲 (Chen Chieh-Hsien) drove in 2 runs with a chopped single over the infield. Seems simple enough? 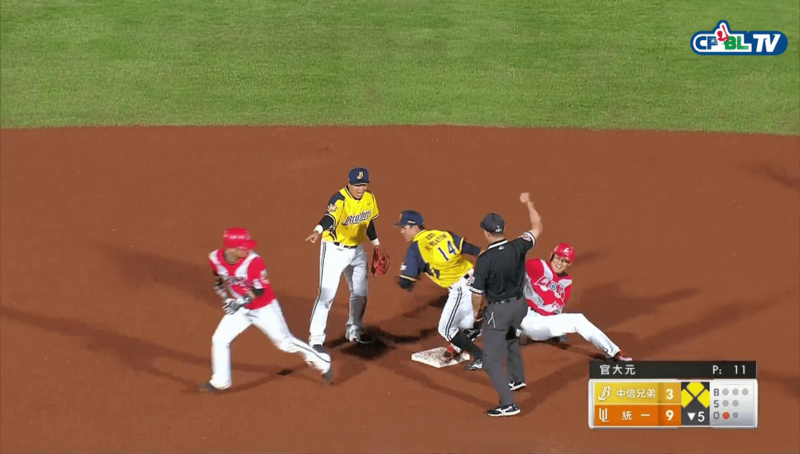 But the story did not end here, Tsai Yi-Hsuan who was on first base was caught in a rundown while trying to return to second and hilarity ensues. With Chen already safely reached to the second base, Tsai, instead of letting the Brothers’ fielder tag him out, he and Chen started doing some sort of baserunning tango around the second base. Long story short, this resulting both runners getting tagged out and instantly ended the Uni-Lions’ rally.